December 1: When the Holidays Whisper, "I Can't BE Until I DO..."
Eva's first trip to the dentist. She hasn't let go of her little Minnie Mouse toothbrush and toothpaste since then. So I finally threw up about a week and a half's worth of photo collages on the blog last night. Pictures waiting in the queue. Thoughts drifting but never articulated. All buried under the business and pressure of the season. I think to myself, I can't post the birthday photos until I get the handful off the camera to post with them. The homeless people came and joined us, after all, and I wanted to write a little something about that. But I can't sit down and write until I get the laundry done, the dishes done, the thank you notes written, the overdue appointments scheduled, the pile school papers filled out, the health insurance information collected, etc.--you know, all those "more important things." Those things that are expected. Those things that people are waiting on. Those things that affect our future. Those things, that at the moment, all seem to be more important than me. Than my soul. Sometimes it's hard to take our focus off the seen to value the unseen. But those lingering mental messages are like a slow, suffocating death to me. "I can't BE until I DO..."
The lie I heard whispering in my ear finally became a full-on shout the other day. As if the doing somehow in and of itself is better. Makes me better, makes the whole shebang work a little better. Like a well-oiled machine. Nevermind that machines don't have a soul. Normally, the laundry is not the boss of me. You can stop by almost anytime at our small little house on the corner of the street, and you will most certainly find laundry living on the loveseat in our family room. It takes up residence there in some form of doneness--unfolded, folded, trampled and refolded--until laundry day rolls around again and it must be moved, because the hampers are now needed for dirty clothes. 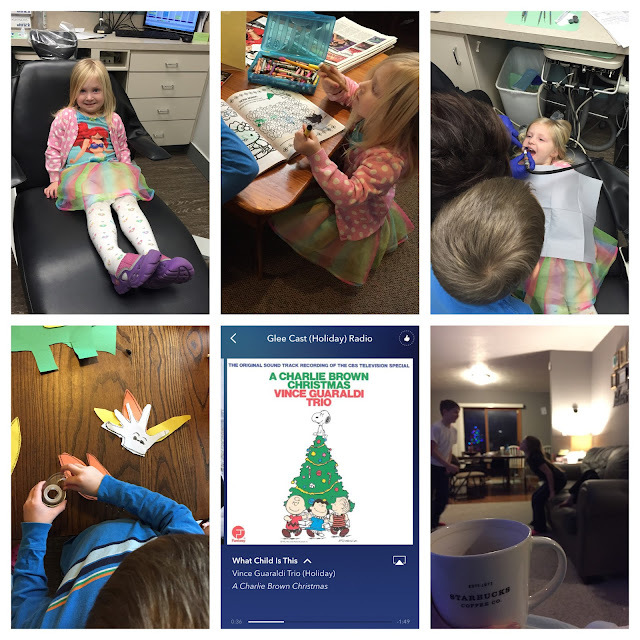 But the holidays come with a checklist of their own, which, by itself may not be so bad, but adding it to the normal craziness of life makes for one overwhelming month. And I've tried to manage it, really I have. We have the tree up, fluffed, and decorated, the stockings hung by the chimney with care. Teacher gifts have been acquired, some presents ordered and on the way. The annoying yet beloved Elf has returned, but I think he's going to come down with the cold we've been passing around shortly and just sit for a few days in all his sniveling, Kleenex-toting glory. It may, in fact, be less disappointing that way, as he's about as reliable as the tooth fairy when it comes to living up to all the hype. I should fire them both. That I haven't done so much. And in all the doing and the keeping up and the making happen, I think I may have allowed a piece of myself to shrivel a bit. A being, by very nature, must spend some time just being. I've realized that in a hectic month of to-do's, it's even more important to just be. Sometimes. For a little while. Before one moves right on to the next thing. Because there is always a next thing. There will always be more to do. But we aren't doings. We are beings. So the machine may not run as smoothly, but my soul will be as velvet once again. Because it's vital, in all the hustle, to spend some time on the things that replenish your soul. The things that breathe life into you, make you tear up, and cause you to wake up. Things that help you remember what it's like to truly be alive. On the heels of the Christmas season, make sure you spend some time just being, my friends. It so happens that the being enriches the doing, but it's a disaster when attempted the other way around. The world will holiday on without you.